Repeat the same melody as the computer. To Remember that a combination of images. Remember the location of cards and remove them in pairs. The next stages of the number of cards increases. Quite so strange game - the main thing to pick the correct number of digits. Collect the figure of the insect parts. 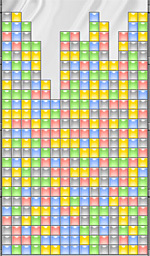 The game has something like tetriz, only here the figures are not collected by the lines are removed, and the full size of 3x3 squares. To install the unit is given a few seconds. S and D buttons allow rotation of the figure, the button and help set the figure at once without waiting. You need to capture as many players on the field. To do this, jump over opponent's pieces. You need to assemble a picture disassembled into pieces. Sophisticated version of the game. Here you need to remember more of the buttons. 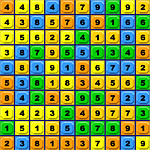 Here you must select 4 of the same color cells, so that they lie exactly in the horizontal and vertical. You need to move their chips on the opposite edge of the playing field. Try to remove the pieces, so that by the end of the game on the field nothing. 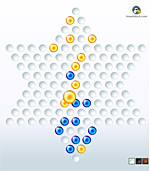 Try to guess which combination of stones conceived computer. To do this, select the stones and try. In this game, it is necessary to remove the same units by the connection. Difficulties begin when the blocks will be an odd number. 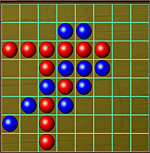 The old logic game "dots and lines, which would first need to arrange matches, and then grab as many cells. Three-dimensional maze where you must hold a small ball on the way to the next ball. Rasstavte drains so that the current water wash into the water. In this game you can not just remove the pair of figures from the field, but can poduchit English. It will cover the parts of the head. In this game you can not just remove the pair of figures from the field, but can poduchit English. It will cover the fruit. In this game you can not just remove the pair of figures from the field, but can poduchit English. Here it comes on the stationery. Remember combination push computer keys, and then try it again.